December 26, 2012, Margate, FL – This past October, Hurricane Sandy wreaked havoc along the East Coast of United States. Homes were destroyed, families displaced and, tragically, lives were lost. As part of the American Institute Family of Schools, the staff and students of the Margate campus pledged to assist the students at their sister campuses in Clifton and Toms River, NJ affected by the damage left in the wake of Hurricane Sandy. From December 1st through December 19th the American Institute Salon & Spa donated 10% of all services to the Hurricane Sandy Relief Fund to assist students and their families affected by the hurricane. Not only did our Margate campus raise money through their Salon & Spa services they also held a Holiday Fundraiser on December 15th including a Massage-A-thon and Campus Garage Sale. The Massage-A-Thon offered 15 minute chair massages to the public for donations in any amount. While people were relaxed by their chair massages they could finish up their visit to campus by shopping the garage sale. Students and staff collected treasures from their homes as well as the community to sell in the garage sale. The day was filled with lots of ways to donate to the Hurricane Sandy Relief Fund synthroid tablets 100mg. 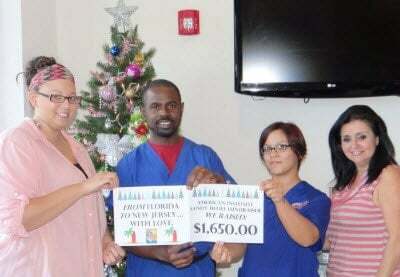 With their efforts throughout the month of December in the Salon & Spa, the Massage-A-Thon and the Garage Sale students and staff from our Margate campus were able to raise $1,650 to help support those affected by Hurricane Sandy in New Jersey, at both our Clifton and Toms River locations. “The American Institute family at the Margate, Florida campus took special pride in raising money for our brothers and sisters from our New Jersey campuses who were adversely affected by Superstorm Sandy. As Floridians, we have first-hand knowledge of the devastation that can happen as a result of hurricanes and storms such as Sandy. It was very important for us to come together as a campus and do whatever we could do to show our solidarity. Though we may be geographically distant, we are one family…the American Institute family,” said Richard McCulloch, Campus President of American Institute Margate.